When you marry someone, you share your life with that person, for good and ill. Every facet of your lives weave together—you create a home, have kids, mingle finances, and build a life. After a while, it’s tough to tell where one life begins and the other ends. That’s part of why divorce is often so tricky. Debt forms an unfortunate part of many of our lives, both pre and post marriage. You know that the court divides assets in a divorce, but what about the other side? 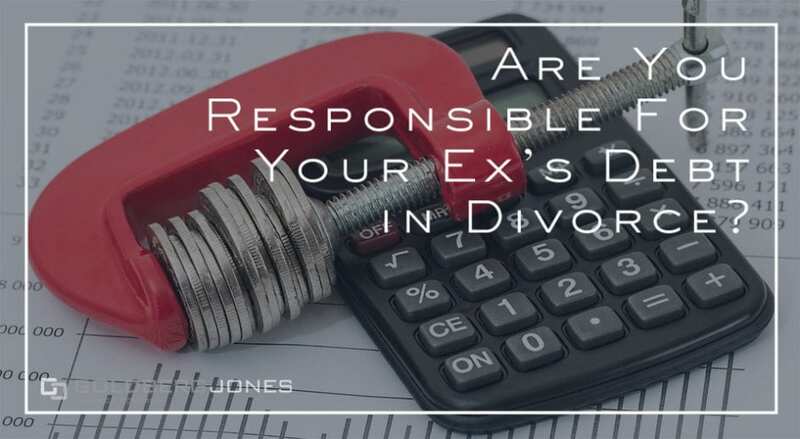 Are you on the hook for your ex’s debt in divorce? Is Their Debt Your Responsibility in Divorce? The short answer is, unfortunately, yes, you’re responsible for your ex’s debt. That said, like so many other pieces of the divorce puzzle, the answer isn’t always so cut and dried. Many factors influence the division of property and, by extension, debt or other financial obligations. When it comes to the division of property, Oregon uses the equitable distribution model. The general idea is for both spouses to emerge from divorce on the relatively equal footing and able to enjoy a standard of living similar to what they had during the marriage. Ultimately, the decision accounts for need, earning potential, and other factors. The courts generally view property and assets acquired during a marriage as marital property. No matter the name on the title, Oregon presumes both spouses contribute to the acquisition. It’s then subject to division in an equitable fashion. Exceptions to this include things like gifts or inheritances. Debt works the same way. If you build up substantial liabilities during a marriage, the court views them as shared marital obligations. These are then divided up based on ability to pay, who is most responsible for them, and other factors. If you buy a house or condo, finance a boat, or secure a car loan, you expect to deal with these debts. But what about unexpected surprises? What if your ex went behind your back and racked up a massive credit card bill without your knowledge? Again, the answer is that you’re most likely on the hook for that amount. From a legal point of view, the court doesn’t care whose name appears on the paperwork. If your ex obtains a credit card behind your back, runs up an astronomical bill, it will likely be a joint obligation. If it’s amassed during your marriage, it’s most likely yours to deal with. At least in part. Related Reading: Is it Time to Hire a Divorce Lawyer? It’s important to know that divorce doesn’t alter existing financial arrangements. For example, if your ex receives a car and the accompanying car payments in the settlement, if your name is on the paperwork, it remains there. Many divorce decrees require one party to refinance the loan or remove the other’s name, but it’s not automatic. The same goes for mortgages and other agreements you undertook while married. Just because the court orders this, doesn’t mean it always happens. That’s why it’s key to make sure everyone follows the plan. If your ex misses an installment of those car payments we mentioned but didn’t take you off the loan, it impacts you. Your credit can take a hit or, in extreme situations, creditors can even come after you for payments. It’s in your best interest to keep tabs. While you will likely find yourself on the hook for the debt your ex built up during the marriage, there’s good news when it comes to the pre-existing variety. Timing, however, is the key in this situation. If your ex rang up thousands of dollars worth of student loans before you tied the knot, that’s not your problem. The same goes for those massive credit card bills that still pop up. For debt following a separation, but before the divorce is finalized, the waters muddy a bit. If the court looks at necessities like electric bills and utilities, they may split them up. But if your ex goes on a lavish ski vacation, that’s probably a different story altogether. As with most areas in divorce, dealing with debt gets twisted in a hurry. In the case of shorter marriages, things may be straightforward, but the longer a union, the more intertwined lives become, and the more complex matters get. You may want to consult an experienced divorce lawyer to help you untangle the mess.